Now before you get all disgusted about the intestinal damage that something this big from Taco Bell can cause, let me give you the run down on the real ingredients. We got a snickerdoodle cookie taco shell, Starburst shavings for cheese, green colored coconut for lettuce, chocolate cake for the meat, marshmallow for the sour cream, and licorice tomatoes. Now that sounds delicious. 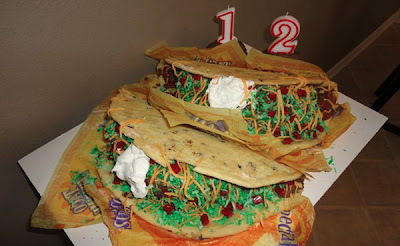 How come I never get a cake like that on my b-day? Ha! Eating tacos that taste like cake! My mind would explode!